There are many parallels between this record and Corazones. 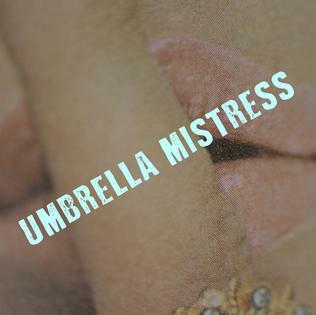 Like many of the songs on that album, Umbrella Mistress’s lyrics are about breakups and lost love. It also uses the idea of the house as a metaphor for a relationship: ‘it’s all or nothing in this house’, ‘lost our house under this weight’. He’s also singing in a similar style – breathy and soft (what I like to think of as his pretty voice, which was most notably evident on the borderline passive-aggressive “Running Away” on Corazones). But where Corazones’s main theme was death, Umbrella Mistress’s heartache doesn’t feel like the mourning of love’s death or the bitterness of a person scorned. Here, it’s more like a resigned self-awareness that the love is gone and there’s nothing left to save. There’s not a lot of spite or malice felt across the tracks, evidenced by the often playful use of language to conjure vivid (and fairly weird) imagery. As the album is mostly upbeat or mid tempo, and if you’re the type of person who doesn’t pay deep attention to lyrics (which I’ll never understand), you’ll be forgiven for thinking it’s actually quite the jolly wheeze. Also, it helps that Teri Gender Bender’s backing vocals add a softness to even the saddest of lyrics. Though TGB’s vocals aren’t front and centre here, her influence is apparent. On “Tell Me What I Did Wrong”, Omar’s pretty voice is cut through by stretched and flattened vowels with abrupt key changes, something I strongly identify with her vocal style. She may be in the background, but her presence adds a depth charge of emotion, as on “Saloenliaze” where her poppy chops balance his fuzzy vocals. There’s no anger here, rather a muted wistfulness evoked by strummy guitar punctuated with occasional mini-rockouts. As with many of the Ipecac Recordings albums, a previous song is revisited – “Through Wires” appeared on Saber, Querer, Osar y Callar as “Fear Eats the Soul”. This version is just as breathy and hesitant but with a harder outro, continuing the trend for a swell of electric guitar punching through as power pop. Cinematic influence is evident here and also on “Eastern Promises”, as both are film titles, though I can’t suss any connection to the content of either based on the lyrics. The latter’s lazy, organesque keyboards and shakers paired with the lyrics with the lyrics ‘lowly broken hearts to blame/stars that gave back nothing/love went down in flames/again’ match the sorrow felt on Corazones, but with more reserve compared to the emotional intensity there. That reserve is carried over to the country-folk pop of “Blue Pale Queen”. It’s hopeful-sad, like something played at a honky-tonk right after the stomper but before the three-Kleenex tune. I love all of Umbrella Mistress dearly and want to push it as hard, if not harder, as I did Weekly Mansions. The tracks I’ve chosen to link to are my favourites and those that I think are both highly accessible and indicative of their sublime transcendence beyond the progressive rock he’s often typecast into. Like “Arrest My Father” on Corazones, title track “Umbrella Mistress” is a lyrical outlier that has me stumped. I have literally no idea what it could be about; here Omar’s ‘wishing him my father dead/I was wishing him my father dead/condemning him to the floor/no enemy of mine/condemning him to the floor’, and the chorus doesn’t elicit any helpful clues either. Whatever it’s about (or not), it delivers unbridled joy via organ that sounds like it’s skipping gaily through a meadow in the summer. And I do love me some batshit lyrics that I don’t quite understand. On the other hand, “Houses Full of Hurt” is beautifully tragic and should be the first song on the Department for Rumination’s playlist. There’s a slight reverb that gives a poignant distance to the line ‘no one wants to kiss you anymore’, the beat like a slow panic attack thudding to desperate realisation. It’s the darkest of all the songs and could be a contender for my favourite, not just on this album but across the entire ORL oeuvre, no hyperbole. On a cheerier note, “Blood Count” jauntily glides in with a glissando of piano charging into two minutes of pure bubblegum pop. The chorus ‘I’m setting to fire to this/teenage dream of love/get outta my way’ feels straight out of a ‘50s teenybopper hit, though this being ORL, we’re later given the advice ‘and walking away won’t heal the pain/so kick his face to the ground’ and some low-key crunchy guitar, like a small handful of granola topping a yoghurt parfait. “Winter’s Gone” is another very upbeat track peppered with handclaps and TGB’s oh-WHOA-oh chorus, another stamp of her ongoing influence. Lyrically it’s a bit of an emotional chameleon – out of context, the lyrics are rather woebegone, but the tone is bright. Depending on your mood, it could be a positive ‘let’s keep trying’ song, or it could be a delusional ‘we can fix what’s broken’ one, or even a ‘I’ll leave if you if you don’t change’ song. There’s a fair amount of contradiction going on, and I’m struck by the line ‘this may be your last song’. Using ‘your’ instead of ‘our’ intrigues me – is this a threat? But maybe it’s for the best, because not all heartbreak songs are kind to the other half. Is it positive assertion? It’s open to interpretation, which could change upon every listen. Closing track “Diamond Teeth” sounds a bit like a late night cocktail lounge song dedicated to the drunken couple sloshing booze over the last remaining sparks of their love in a doomed attempt to rekindle it. I wonder if there’s a message to fans in this one: “all these sad, sad songs/will never amount to anything/but if these sad, sad songs/should give you hope…”; it proves an apt album summary. Sad songs are nature’s onions – we listen to them to distance and compartmentalize our emotions or simply to seek kinship for our misery. But sometimes we need them to be a bit hopeful, to remind ourselves ‘it’s a matter of time before the spring comes through’. Umbrella Mistress is a flawless collection of these kinds of happy-sad songs.